Teaching the “great books” (the “classics,” the “canon,” “monuments of tradition X”) has never been more difficult, or more necessary. Like writers themselves, literary texts (works of art in general) are not born “great.” They achieve and maintain their status through complex processes of interpretation and reinterpretation whereby readers (re)discover the relevance of what was to what is. In a global context––with students coming to our classrooms from all over the globe and heading out into a world of increasingly shared knowledge in science and business, “great books” have (or should) become the property of a global intellectual community as it strives to define itself as a complex whole. Building a global canon of literature is an educational priority and a challenging, sensitive, self-contradictory venture in cultural politics, particularly since “literature” embraces not only fiction and poetry, but philosophy, historiography, and social thought. Educators face issues of selection and value judgment, of interpretation, and of engaging their various audiences. They also must contend with the minutiae of historical realities (some of which may no longer exist), difficulties that arise in translation (linguistic and cultural), and transformations of a work from one medium to another. Teaching the “great books” cannot be the sole prerogative of philologists, if ever it was one. There is also another important and delicate aspect to consider: the Great Books project was born in the US in the pre-global era. How must the Great Books project be modified for use in a globalized context in educational traditions as different as the Russian or Chinese? In 2015, participants of the XVIII Fulbright Summer School in the Humanities will consider questions surrounding courses in critical reading of (and writing about) “great books” across the disciplines, particularly at the university level. We will survey existing course models and explore how they might be transformed to function trans-nationally and trans-culturally. Regarding relevance, we will examine our role as negotiators between our students, the generation of “millennials,” and the world’s intellectual heritage, between local issues and cosmopolitan impulses, between aesthetics and politics. Finally, we will reconsider the role of close reading in the context of this global intellectual agenda. Theme: Classics do not “become”on their own, but arise as the function of society’s cultural (specifically educational) institutions. How is the process of canon-formation organized? Day 2. National Classics in an Age of Transnationalism. Theme: National politics as a factor in the “invention” of literary tradition and the formation of strategies for humanistic education. The situation in Russian education: between the necessity of preserving heritage and the necessity of meeting the challenges of globalization. 14.30–16.00 Discussion. 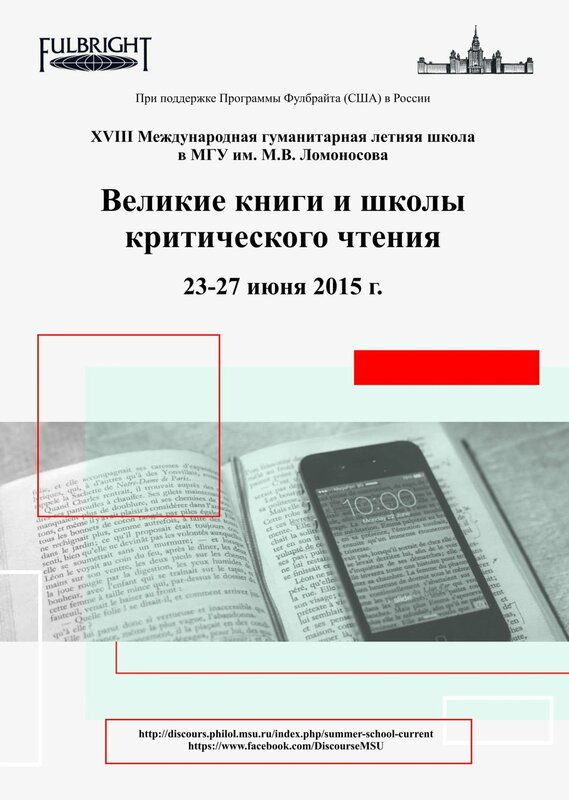 “The National Classics in School: Debates on the Literary Canon in Russia since 2000. 17:00-19:00 Film Screening: The Girl in the White Coat (Director: Darrell Wasyk, Canada, 2011). Day 3. “World” Literature Past and Present. Problems of translation and the practice of reading. Theme: How are tensions between local and national versus common and global resolved (or not resolved) in various cultural traditions and contexts? What is the role of translation—both linguistic and through the media—in forming (a new type of?) trans-cultural literacy? Opportunities for teaching “close reading,” “slow reading,” “critical reading” in the humanities (non-humanities) classroom. Pedagogies of reading and the formation of transcultural and transdisciplinary literacy. Day 4. New Technologies as a Factor in Reforming the Literary Canon. Theme: What role might new technologies play in providing new means for the transmission of literary-cultural heritage? What lessons can the “Great Books” and “Critical Readings” offer the children of the Internet generation? Discussion leaders: Irina Kaspe (NRU-HSE), Diane Nemec Ignashev (Carleton College, MSU), Polina Rybina (MSU). 16.30–18.00 Steven Duncombe, “OpenUtopia: Marking the 500th Anniversary of Thomas More’s Utopia. Video-conference. Theme: How do we teach “worldliness” in the context of globalization? Courses in “world,” “foreign,” and “comparative” literature and culture today as an area of active methodological search and experimentation. Jointly sponsored by the Fulbright Foundation and Moscow State University, a five day Summer School was held in Moscow from June 23rd to June 27th. I was fortunate enough to be able to participate in the Summer School, organized around the question of how national canons (“classics,” “Great Books”) might be modified into a more international canon, shared by many nations, in a new age of global contact and awareness. The work of the school can be summed up in two words: joyful learning. The daily experience of the participants in their exchanges with each other dramatized the intellectual issues and the human rewards of international co-mingling of ideas—and persons. Over the years, I have participated in a number of international undertakings in Asia, Europe, and the Americas. On that basis, this year’s Fulbright experience in Moscow was the most successful of all such events in my long experience. The organization of our sessions was superb, yet invisible, permitting us to actively engage intellectually and personally with each other. At a time when there is some political dissonance between Russia and the United States, it was heart-warming to experience such warmth and curiosity in a community of Russian and American intellectuals. We Americans were reminded again of why our word ‘intelligentsia’ is of Russian origin. The participants from such distinguished American campuses as Harvard, Yale, Washington University, and the University of Pennsylvania, were all impressed by the energy, imagination, and hospitable warmth of their Russian counterparts. We all learned a lot from each other. The Moscow summer school was the kind of event that the Fulbright grants were designed to foster—it was the Platonic idea of creative international scholarship. Such successful events do not just happen, and the enabling role of Professor Venediktova and her staff deserve a special mention for making it all come together. First, I was deeply impressed by the high level of intellectual engagement and commitment shown by your workshop participants. Their questions and observations reinforced the hopes I have that teachers of literature, history, and other areas of the humanities in Russia can continue to play a role in supporting efforts at Russian-US understanding. At this difficult time in US-Russia relationships, it is particularly important that major purveyors of our national histories and culture go about their work in a professional and reflective way. In some respects, we are all still stuck with Plato’s vision of how to harness rational thought to rein in the passions, but this takes on new guises in every age, and we have particular challenges now. In such a context, your workshop sponsored by MGU and Fulbright is an important contribution. Second, I was delighted to meet several of your colleagues and students, especially from the younger generation. I will do my part to help them build bridges with people in the US in the hopes that long term professional t ties between Russian and American scholars can thrive in the decades ahead. The focus on world literature was inspired. I am not sure I am any more convinced now than I was before doing the readings and participating in the workshop that the category of world literature makes a lot of sense, but the efforts you so brilliantly led to get people from so many backgrounds to work through this idea and see how it affects our various professional activities was inspired. As I outlined in my presentation, I see evidence that we are all deeply embedded in unconscious habits of thinking and emotion that are major barriers to thinking and working across national boundaries, but we can indeed become much more reflective on these barriers and manage our differences in world views much more effectively than we often do. This is a very challenging task, and it is one that will require harnessing the best ideas from a range of disciplines that extend well beyond traditional humanities, but it is doable, and efforts such as yours are crucial in this respect. I continue to see national schematic narrative templates as shaping a great deal of our international dialogues, but by appreciating the depth of unconscious mental life that lies behind our positions, we can start thinking about how best to manage them. I keep using the term “manage” quite consciously because I think it is a matter of managing differences rather than overcoming or erasing them somehow. I think that the Fulbright Summer School 2015 has been instructive in many aspects for me both as a teaching assistant in European and American literature of the XIX century and as a scholar at the outset of my academic career. It was a contribution to my general knowledge with Professor Holquist talking about the philosophical evolution behind the comparative language/literature studies and the challenge posed by digital humanities. It was also a reflection upon the institutions and practices of canon formation, as well as an exchange of the experience in reading, teaching and translating ‘great books’ in contemporary Russia, United States and Germany. What matters much is that a range of contradictions was revealed and actually played out during the sessions – namely, the tensions between close reading, potentially global appeal across times/cultures and reconstructing the historical context. Is ‘close reading’ the only way to approach the aesthetics of a classical text? Is it a practice peculiar to literary studies (or ‘philology’, using a word more familiar in Russian and German context) and what is at stake if we adapt it to a less specific audience? How can we turn the historical distance separating us from the classical text into a resource that may help us to reflect back upon our own cultural experience? The practical emphasis and the multiple opportunities for debate were the strongest points of the program. The School had a rich potential, and in order to develop it further I may suggest that there could have been some workshops/seminars as it was during the Summer Schools in transnational humanities (2012) and academic writing (2013). It could have been a workshop in course-building (drafting together a curriculum for an imaginary course in world literature) and/or a seminar that would test different interpretations of a cross-cultural selection of short texts (a brief but illustrative example was suggested by Professor Damrosch).